Are you dreaming about getting married in Big Sky, Montana? There's something magical about our mountain town that makes it the ideal place for a destination wedding. Will Big Sky be the place where you and your loved one exchange vows and tie the knot? We hope so! Pick up any wedding magazine and you'll quickly see that the world is filled with charming wedding venues. If you love the mountains and the genuine Montana state of mind, then we encourage you to get married right here in Big Sky. With numerous wedding venues in Big Sky, Montana you really can't go wrong. Choosing your wedding venue is a major decision. It will ultimately dictate many other aspects of your wedding day including the guest list, the budget, the experience, the colors, the menu, the photographer, the outfits, the time of year, and the list goes on and on. Planning a wedding is small task. Luckily, when you get married in Big Sky, everything you and your guests need is right here. Wedding ceremonies are a magical experience for everyone involved. On your special day, you'll want to spent it with your closest friends and family. The people on your guest list will come from near and far to celebrate your wedding. When you select Big Sky as your location of choice, your guests will be thrilled. People just seem to love it here. If you're truly planning to get married in Big Sky, you likely already know about how easy it is to get here, the endless outdoor activities for people of all ages, the easy access to the mountains and the great outdoors, the range of restaurants, the shopping opportunities, and the lodging options. Big Sky offers the full package. What you might now know is that Big Sky has everything you need for a wedding too. That list includes chapels, transportation, caterers, florists, photographers, wedding planners, spas, and more. Get all the links you need to plan your Big Sky wedding here. 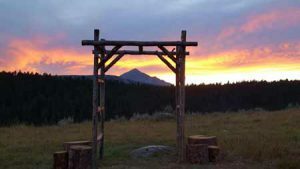 Whether you want to get married at a guest ranch, on the flanks of Lone Mountain, or along the banks of the Gallatin River, the first step to planning a wedding in Big Sky is to select the perfect wedding venue for you. Do your research and contact these wedding venues in Big Sky to learn more. Lots of people want to get married in Big Sky, Montana so lock in the date sooner than later! We truly believe that a charming Big Sky wedding will exceed your expectations - and we know your guests will love it too. If you need any help planning your trip to Big Sky, please visit check out our website: VisitBigSkyMT.com. We wish you a lifetime of health and happiness!